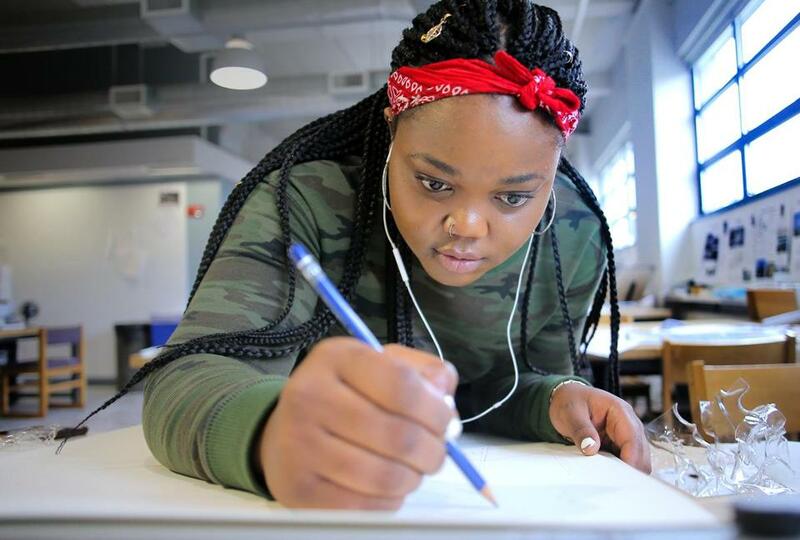 Esther Bahati worked on a drawing at Wentworth’s architecture lab. This cavernous room on the third floor of a renovated high school building is one part art studio, one part engineering lab. The architecture laboratory at Wentworth Institute of Technology is a hive of around-the-clock activity by students learning how to design the buildings of the next century, or at least deep into this one. From one end of the long room you can see all the way to the other end, across rows of desks where, at any given time of day or night, students are working on spindly models, huge drawings, or plaster molds. Wentworth has the largest undergraduate architecture program in Boston, and students can earn a master’s degree in five years. 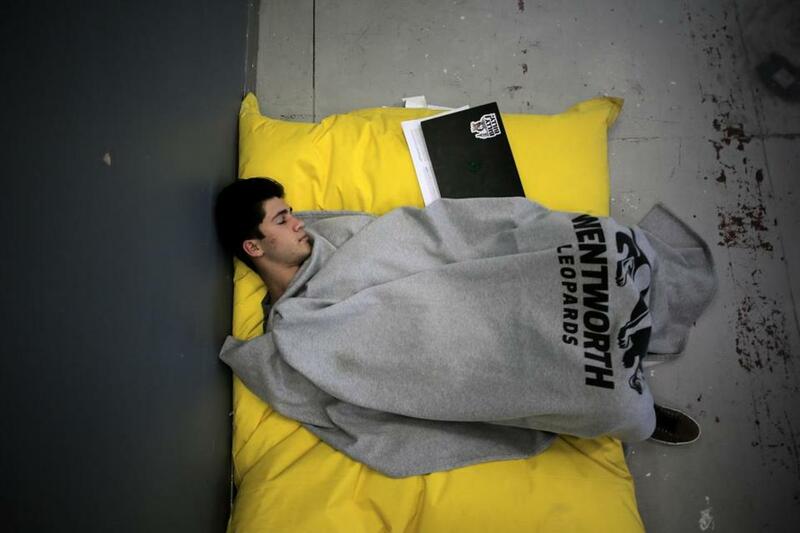 Unlike many of the other students at the cluster of colleges in the Fenway, many Wentworth students are from Massachusetts — a total of 460 in the undergraduate and graduate architecture programs. Just one month into the semester, models, posters, and supplies have already begun to crowd the room. It is quickly becoming the students’ second home. Technically, the lab closes at 2 a.m., but there is a way to sneak back in and work until 4. “It’s basically your new home,” says his classmate Moe Shuman, of Quincy, who works across from Estremera. 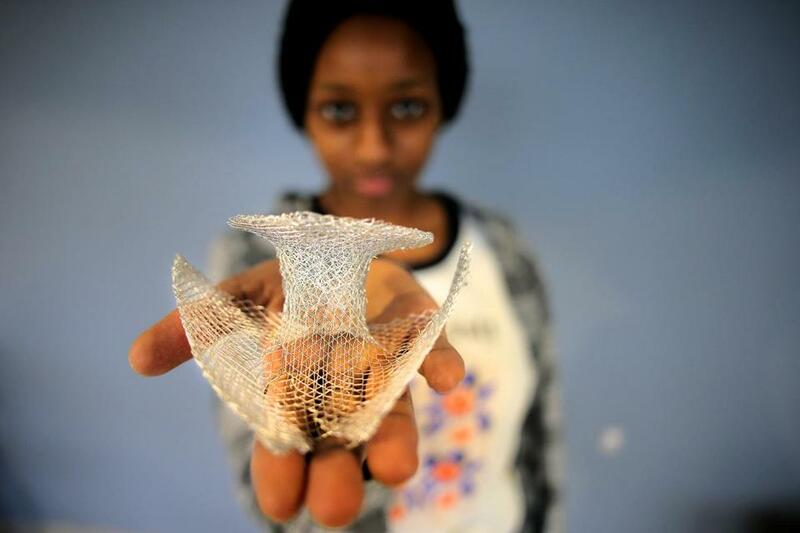 Crystal Njoroge showed a wire-mesh air cube design. Completed and half-finished projects line the window sills and tables, and chips of plaster of Paris coat the floor. Hand-drawn “save” and “do not touch” signs guard three-dimensional creations of paper and wood and cardboard. Corners of the desks are plastered with old drafting dots, and paper drawings are pinned to the walls. Odds and ends, including Pam cooking spray, sit on windowsills; it’s a home remedy for getting plaster out of molds. Freshmen and graduate students work side-by-side in this lab, and they pass such tricks on to each other. Light floods in from the sides of the long room off of Huntington Avenue. Outside of the window is the architecture of Boston, structures that the students say gives them inspiration from the past. But these students are learning how to design the buildings of tomorrow — resistant to climate change and made using sustainable techniques, including a new kind of wood-framing for buildings. Inside small, brightly lit rooms in the center of the floor, students present their work to professors for critiquing. Andrew Herzog napped in a beanbag chair. In other corners, people doze on beanbags or take a moment to reflect. The students are learning how to preserve their creativity amid what can be monotonous work. They share the frustration when they have to redo a project. But the professors don’t care how many times they have to redo it, as long as they get it right. Nearby, a class is working with professor Tom Chung on a project for Eliot Church in Roxbury. The church’s school closed, and officials there want to replace it with affordable housing. They have asked a class of graduate students to help; the students are beginning to come up with ideas that are pinned up on rolling bulletin boards that form a makeshift classroom. Nearby, a group of graduate students are working on an architecture project for Benin, a country in West Africa. The students have quickly become a family, of sorts. They pool money to buy materials and swap tips on where to get foam board and wood. There are a lot of trips to the Blick art supply store and much sharing of advice about which materials to order on Amazon and which to buy at Home Depot. Estremera and his desk mate are laboring on what can be grueling exercises that teach them the basics of shape and light. They had to create models, then photograph them from different angles. They are also drawing three-dimensional shapes from different angles. The work can get tedious, but it can also be peaceful. “It’s a different atmosphere; it’s a place where you can relax,” Estremera says. 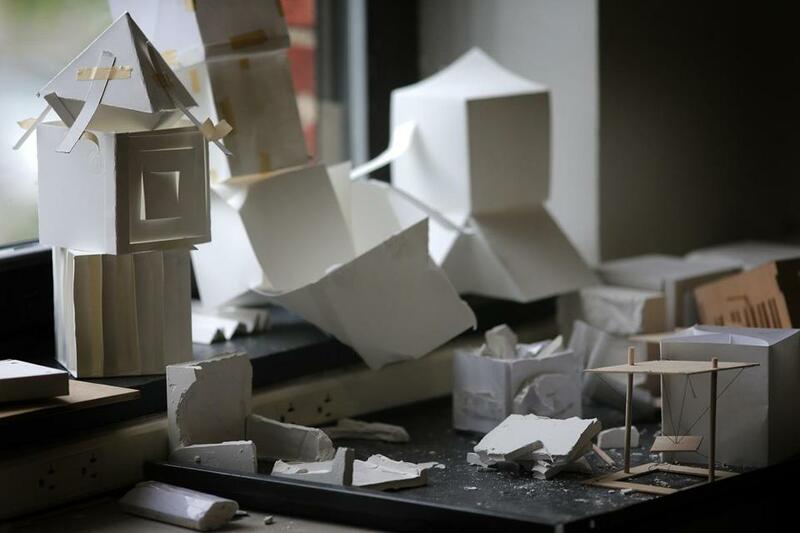 Models of wood, paper, metal, and plaster are strewn across the lab.